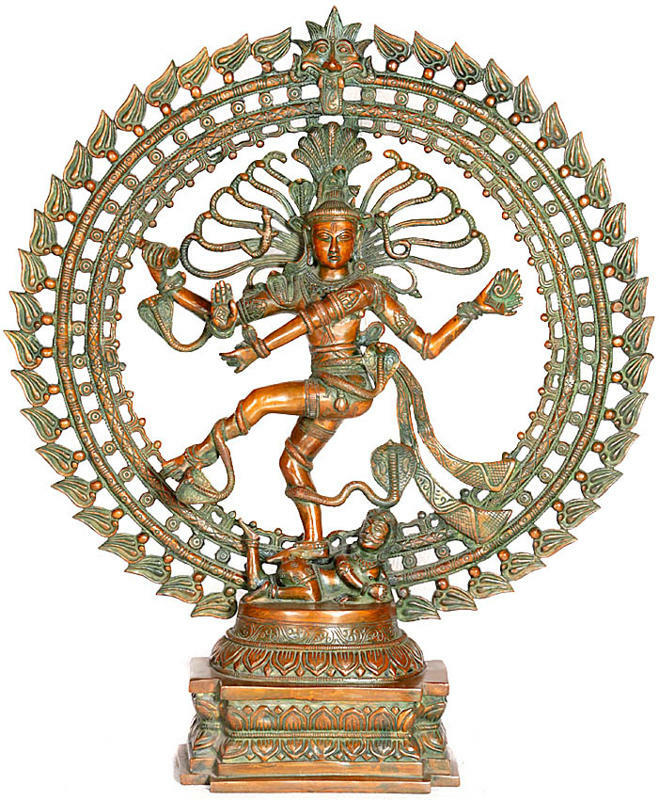 Nataraja is the most popular representation of the Hindu God Shiva. In Sanskrit, Nata means dance and raja means Lord. Shiva therefore is the 'King of Dancers'. To understand the concept of Nataraja we have to understand the idea of dance itself. Like yoga, dance induces trance, ecstasy and the experience of the divine. In India consequently, dance has flourished side by side with the terrific austerities of meditative yoga (fasting, absolute introversion etc.). Shiva, therefore, the arch-yogi of the gods, is necessarily also the master of the dance. Shiva Nataraja was first represented thus in a beautiful series of South Indian bronzes dating from the tenth and twelfth centuries A.D. In these images, Nataraja dances with his right foot supported by a crouching figure and his left foot elegantly raised. A cobra uncoils from his lower right forearm, and the crescent moon and a skull are on his crest. He dances within an arch of flames. The upper right hand holds a hour-glass drum which is a symbol of creation. It is beating the pulse of the universe. The drum also provides the music that accompanies Shiva’s dance. It represents sound as the first element in an unfolding universe, for sound is the first and most pervasive of the elements. The story goes that when Shiva granted the boon of wisdom to the ignorant Panini (the great Sanskrit grammarian), the sound of the drum encapsulated the whole of Sanskrit grammar. 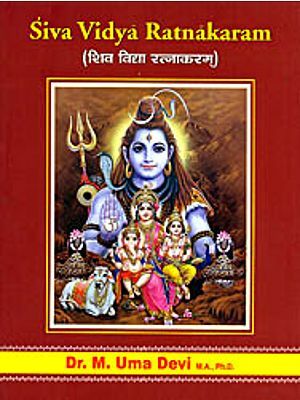 The first verse of Panini’s grammar is in fact called Shiva sutra. The hour-glass drum also represents the male and female vital principles; two triangles penetrate each other to form a hexagon. When they part, the universe also dissolves. The opposite hand, the upper left, bears on its palm a tongue of flames. Fire is the element of destruction of the world. According to Hindu mythology at the end of the world, it will be fire that will be the instrument of annihilation. Thus in the balance of these two hands is illustrated a counterpoise of creation and destruction. Sound against flames, ceaselessness of production against an insatiate appetite of extermination. The second right hand is held in the abhaya pose (literally without fear) and so a gesture of protection, as an open palm is most likely to be interpreted. It depicts the god as a protector. The left leg is raised towards the right leg and reaches across it; the lower left hand is stretched across the body and points to the upraised left foot which represents release from the cycle of birth and death. Interestingly, the hand pointing to the uplifted foot is held in a pose imitative of the outstretched trunk of an elephant. In Sanskrit this is known as the ’gaja-hasta-mudra’ (the posture of the elephant trunk), and is symbolic of Ganesha, Shiva’s son, the Remover of obstacles. Shiva dances on the body of a dwarf apasmara-purusha (the man of forgetfulness) who embodies indifference, ignorance and laziness. Creation, indeed all creative energy is possible only when the weight of inertia (ignorant darkness) is overcome and suppressed. The Nataraja image thus addresses each individual to overcome complacency and get his or her own act together. I have put this Shiva Nataraja in my cart. Will thre 25% discount automatically appear? Is this piece made by the lost wax process? Lastly, if possible can you forward a few moe, detailed photos especially of the Shiva figur- face, body, hands, legs? Hoping to purchase, thank you.